Jellyfish belong to the phylum Cnidaria, a group that also includes coral, sea anemones, and hydra. Cnidaria is one of the earliest branching metazoan lineages, and the group had undergone significant diversification some 500 million years ago. As the sister group to the bilateria, which comprises 99% of extant animals (including humans), studying cnidaria can shed light on major events in the evolution of complex animal life. While the bilateria have been successful on both land and in sea, cnidarians have stayed in the water. Among the cnidarians, jellyfish are arguably the most active: swimming and hunting prey using the minimum amount of energy, making them among the most efficient jet propulsors on earth. Their unique lifestyle relative to other cnidarians is reflected in different genes and mutations that have been positively selected for over millions of years. For example, we found that they have well developed muscle and neuronal signal associated genes published in BMC Biology and, as they swim both vertically and horizontally, they have evolved rapid control of osmosis to survive in different solute concentrations. Phylogenetic position of Nomura’s jellyfish and relationship with other published cnidarian genomes. The best way to understand and even define jellyfish is to compare jellyfish genomes against the genomes of other cnidarians containing sufficiently divergent genes and proteins. As jellyfish and other cnidarians such as hydra and corals are evolutionarily very distant, it is easy to compare them phenotypically. However, at this level it is difficult to pinpoint the precise genetic variations that make jellyfish jellyfish-like. 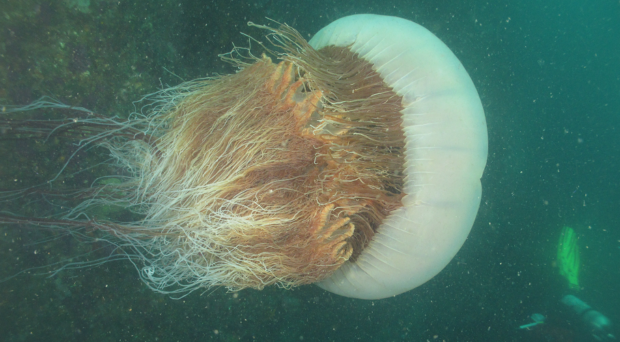 Fortunately, there have been numerous cnidarian genomes published and we have detected protein domains, genes, and pathways that are specific enough to define jellyfish genetically. In order to compare jellyfish genomes, one needs to find some jellyfish! – and in this respect we have been lucky that there are many gigantic jellyfish floating around in the warm southern coast of Korea. These giants – up to 2m across and weighing 200kg – are called Nomura’s jellyfish: sometimes considered a foodstuff in Japan, also dangerous and sometimes even lethal, and oftenhated by Korean fishermen and fisherwomen. Until recently, Nomura’s jellyfish was found mostly around Yellow Sea and South China Sea, which now spreads far down to South pacific. Perhaps due to global warming and overfishing swordfish and tuna, Nomura’s jellyfish are now flourishing in the waters of Korea and East Sea. [Nomura’s jellyfish] genome size turned out to be moderate for a cnidarian, 213 Mbp. This is a tiny genome compared to human’s 3 Gbp. We caught one of them to sequence its genome and transcriptome and compared it with other cnidarian and bilaterian genomes. The first step was to assemble its genome from short (Illumina) and long (PacBio) DNA fragments from sequencers. After that, it was a matter of identifying the genetic differences compared to seven other cnidarian genomes such as coral, sea anemone, and hydra. Currently, there are seven cnidarian genomes that have been published (including Nomura’s jellyfish). We focused on interpreting the function of jellyfish using the genetic differences as they have a morphologically distinct difference. Nomura’s jellyfish belongs to the Scyphozoa, or “true jellyfish” – the genome of another scyphozoan, the moon jelly, was recently published in Nature Ecology & Evolution. Its genome size turned out to be moderate for a cnidarian, 213 Mbp. This is a tiny genome compared to human’s 3 Gbp. Still, it had the almost the same number of genes (19,525). As HOX genes affect body shape, we analyzed HOX genes to just show the different combinations of HOX genes. Jellyfish is unique among cnidarians for their head (bell, medusa) and tail (tentacles). Although we observed unique genomic organization of the HOX genes within the jellyfish genome, there is currently no model to link HOX expression and the downstream developmental pathways to specific physical characteristics. From genomic comparisons, we have also found that jellyfish genomes seem to have adaptations to “cellular chemical homeostasis”, and “sodium ion transport” functions than any other cnidarian. This makes sense as noted previously because they have to travel far to catch prey both vertically and horizontally in water. Jellyfish are not smart, and they do not have a brain, an eye, or other sensory organs. They only have small sensory structures around their distinctively round bells. These sensory structures are known as rhopalia. Jellyfish uses its rhopalia and nervous system (nerve net) to identify light and odor. Compared with bilaterian animals, such as human, fruit fly, and zebrafish, we found that a large number of sensory receptor-related gene families were reduced in jellyfish as with other cnidarian species. Jellyfish catch prey using their tentacles. They are also an important defense mechanism. In order to deliver their infamous sting, they have evolved specialized structures called nematocysts. They have thousands of nematocysts in each of thousands of cnidocytes on their tentacles, which deliver thousands of tiny doses of venom when stimulated. Typical jellyfish venoms include phospholipase A2 and metalloproteases, and indeedwe found many venom related protein domains and genes as befits an active predator. The jellyfish genome was an interesting case of geno-phenotype linkage. It has shown the genetic signatures left in its evolution in terms of structure (bell and tentacle), chemistry (water osmotic adaptation), and function (muscle movement for jet propulsion) in one body. Jong's Ph.D. thesis is "Genome sequence analysis and methods" completed in 1997, MRC Centre, Cambridge, UK. He has been working to sequence everyone and everything on Earth to completely map the biopathways of aging. He predicts that by 2042, scientists will succeed to stop aging process completely in animals by altering the gene expression and epigenetic patterns of cells using. He defines the stopping and reversing of aging study "Geromics" for Gero+Omics. Geromics needs genetic precise targets for ‘writing/editing’ genomes. He tries to discover such geromic targets by hacking DNAs of jellyfish, coral, whale, bat, vulture, tiger, lion, leopard, crane, and humans. Dr. Seungshic Yum has been working as a Principal Research Scientist at Korea Institute of Ocean Science and Technology (KIOST), and a professor at Faculty of Marine Environmental Science, University of Science and Technology. Major interests are the marine environment and marine organisms in relation to environmental changes and the responses to the external stress by applying Genomics approaches. Hak-Min Kim is a Bioinformatist at UNIST, Ulsan, Korea. He is interested in how animals evolved from their ancestors. He has participated in several animal genome projects such as tiger, whale, leopard, lion, vulture, and jellyfish. He is interested in discovering new mechanism of life propagation through genome informatics.